This shopping precinct was not purpose built. New shops were added in front of this early Glebe village as the suburb became more built-up from the 1880s. Eric Shaw, Glebe’s last cobbler, occupied what is now the front of Naggy’s Cafe until the 1980s. Building in colonial New South Wales lagged behind that of its model, England, by several decades. 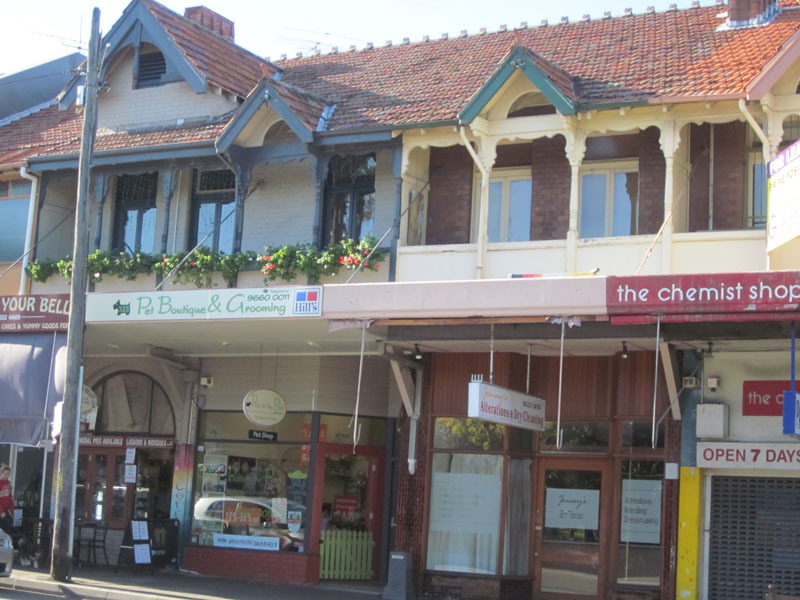 It is common to find houses in Glebe from as late as 1860 still built in a much earlier style. To complicate the picture further, it is not uncommon to find buildings of all kinds that have been adapted and altered over time, sometimes with the addition of complete new sections with different functions. In the 1850s this section of Glebe Point Road contained a substantial collection of houses, and the resulting cluster could well be called the first Glebe village. Those that remain are now concealed behind rows of shopfronts built at various periods. A particularly attractive group of these added shopfronts is the Federation row with gables, balconies and turned wooden columns at 317-327. This row even has the original carriageway, under the large gable, that gave access to the courtyard at the rear, now enclosed to become a tiny delicatessen (325). At 331, Lien’s Restaurant, it is possible to see the interior of one of the original large Georgian houses. A staircase leads down to the stone basement, with its huge kitchen fireplace. There are walls of convict brick, and from the upper floor there is a fine view of the City skyline. Turn right into Ferry Road (the ferry in question was the one that crossed Blackwattle Bay before a bridge was built or Wentworth Park reclaimed). Burton, Craig; Builders and Architects of Glebe, 1828 to 1914, Rare Book collection, Fisher Library, University of Sydney.